Select Items. The new interface "Select Items..." (in menu Edit | Select) lets you select multiple items in the current file list by way of a freely editable list of item names -- a highly useful feature as is shown in the use case below. 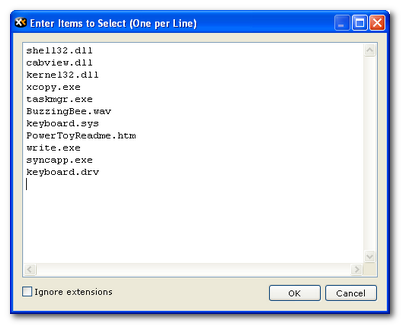 Go to System32 and this will select a bunch of files with a single click. One item name per line. Empty lines are allowed and ignored. Full paths are allowed in the list and will be ignored at the matching. Encoded URLs will be decoded (%20 is decoded to space, etc.). URL queries (e.g. viewtopic.php?f=3&t=5502&p=51346) are allowed and ignored at the matching. The sequence of the item names does not matter. Leading and trailing spaces around each name are allowed and ignored. Matching is case-insensitive (A=a), so you can state the names with wrong capitalization and still have them selected. XY native and environment variables are allowed (though rarely useful here, I think). Ignore extensions: If checked then matching is done only against the base of the given item names, and one item name can potentially generate any number of selections in the List. The state of the checkbox is remembered within the session. 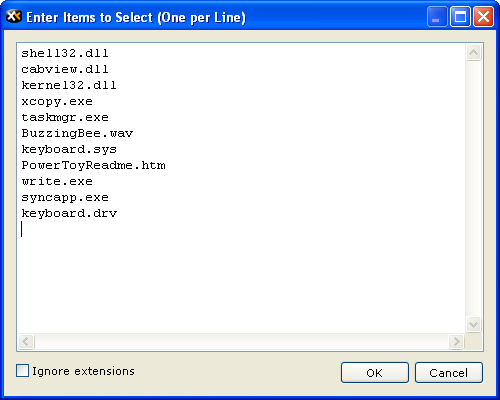 The last used list is remembered within the session. Use Case: This interface enables you to perform a potentially large, complex, and not-rule-based multiple selection in a very easy and convenient way. There is no other way to do what Select Items... can do for you. Here's an example: Say you are going to overwrite 250 files in a folder of 5,000 files with newer versions. But you'd like to backup the original versions first. How will you grab those 250 out of the 5,000 without spending a tedious time with manual selection? Using Select Items... this is a snap: Go to the folder with the 250 new items and copy their names the clipboard (Ctrl+Shift+P); then go to the folder with the 5,000 items, click Select Items..., paste the 250 names into the text box, and click OK; all original items about to be overwritten are selected and ready for backup! This will take you less than 10 seconds. Selection Filter. The Selection Filter (in menu Edit | Select) now can be limited to select only files or only folders. new*        Select all items starting with "new"
*:>new*     Select all files starting with "new"
\:>new*     Select all folders starting with "new"
>^new       Select all items starting with "new"
*:>^new     Select all files starting with "new"
\:>^new     Select all folders starting with "new"
*:!>^new     Select all files NOT starting with "new"
= Add matches to the current selections. = Remove matches from the current selections. DOS commands. DOS commands (that you can feed through the Address Bar) now support XY native variables and Environment variables. Titlebar. Now you can define the layout of the main window's titlebar. This can be done in menu Tools | Configuration... | Templates. Note the double quotes surrounding the whole argument which are needed because of the spaces in the script line.